W.B. Hibbard & James Porter, Milwaukee, WI. Saginaw River near West Bay City, MI. 1853, May 12 Launched; enrolled Milwaukee, WI. 1854, Apr Patent steerer installed on rudder head. 1854, Sep Collision with schooner GRAND TURK on St. Clair River. 1856, May 15 Ran on reef in North Passage, Lake Erie, off East Sister Island; jettisoned 413 barrels to release her; later damaged in collision on St. Clair Flats. 1860, Sep 21 Collision with schooner ALMA between Buffalo & Erie. 1861, Jul Collision with brig MAYFLOWER on St. Clair Flats; rebuilt. 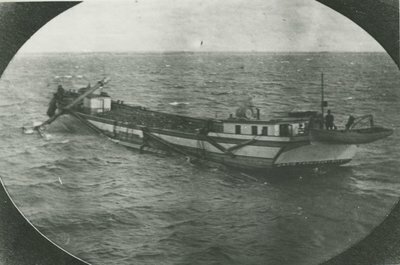 1863, Aug Collision with schooner J.H. DRAKE on St. Clair River. 1864 Owned E. St.John Bemis, Buffalo, NY. 1865, Jun Dismasted Lake Huron; rebuilt, rerigged as 2 mast fore & aft schooner; 223.47 gross / 212.30 net tons; owned J.C. Harrison, Buffalo, NY. 1869, Jul Damaged in heavy weather, Lake Michigan. 1870, Aug Ashore Cove Island, Georgian Bay, Lake Huron; lumber laden for Cleveland, OH. 1871, Jul Sunk, Eagle Harbor, Lake Superior; raised. 1871, Oct 18 On reef & waterlogged Kincardine, ONT with 14,000 bushels wheat; released by tug U.S. GRANT. 1876 Owned Buchley, Chicago, IL. 1879, Oct 7 Owned E.J. Vance, Bay City; towed by BENTON in lumber trade. 1884 - 85 Made a sloop - one mast. 1887, Apr 6 Owned R.M. Bradley, Bay City; towed by BURLINGTON, B BRADLEY & JAMES P. DONALDSON. 1890, Mar 2 Barge with 2 short masts. 1896, Oct 7 Owned Allson Trudo, Augres, MI. 1900, Feb 14 Redocumented as barge. 1900, Jun 30 Dismasted with coal. 1902 Capacity 275,000 board feet lumber. 1907, Fall Mauled & dismasted by storm; abandoned Saginaw River. Email your Order Comment on this item Create electronic postcard Lake Huron, Jun 30, 1900.